View a selection of my past projects. Please contact me if you're interested in any of my work, some pieces were made for exhibition and may be available to buy. I can take past designs and develop them to suit you, using your choice of timber and made to your required dimensions. Alternatively, I can design you something completely new from scratch. See the Commissions page for more information on this process. Commissioned as a focal point for a new Quaker meeting house this table features laminated curved legs, wedged through tenons and a stunning book-matched circular top in Burry Ash. The dimensions also suited well as an occasional table so I made a second table for exhibition in my showroom. With a highly figured Burr Elm top and curved Oak legs this table combines a simple elegant shape with beautiful timber. It was commissioned as a living room centrepiece and uses the last of a special batch of Burry Edinburgh Elm. Burr Elm and Oak with Walnut pegs. My aim with this table was to create a simple frame to show off this beautiful piece of natural edged Burry Ash. The scorched Oak sets it off perfectly and has a lovely deep texture. This table is currently on display in my showroom and is available to buy. Commissioned for a beautiful new-build in the Borders, this 10 seater dining table is specifically designed to be wheel-chair accessible. It uses the same split-leg concept as one of my previous designs, where curved legs and rails intersect with scribed and pegged joints. This puts all the joinery on show as a feature of the design and is also extremely strong. Unlike the previous design, the legs curve inwards so as not to impede the wheelchair and allow maximum leg room. Made in Ash with Walnut pegs. This pair of simple benches were made for an entrance porch and have space underneath for wellies, shoes and hats and gloves in the baskets. Mitred at the corners, a series of smooth curves have been carved into the surface and follow around the top and sides. Please enquire if you’d like made to measure versions of these benches in your choice of timber. I designed these unique tables for an exhibition called 'After the Storm' at the Royal Botanic Gardens Edinburgh (Dec 2016 – May 2017). Several trees in the gardens were blown down or damaged during Cyclone Andrea in 2012, and this exhibition invited furniture makers across the country to enter designs using the wood from these trees. The theme was rejuvenation and regrowth and twelve winning designs were selected including mine. I chose to combine timber from an Oak tree and a Norway maple and as it was storm winds which ended the lives of these trees I decided to make storm winds the inspiration for their new life in these tables. The maple has been cut, bent and reformed into legs reflecting the spiralling winds at the eye of a tropical storm. These storms have a terrifying power to destroy but also a beautiful and fascinating structure, with a wall of strong winds revolving upwards around a calm 'eye'. The oak used for the circular tops has a ripple through the grain, which shimmers in the light adding to the overall sense of movement. The two exterior photos were taken by Pavel Tamm at the site where the trees originally stood. Guide Price £1950 each or £3800 for the pair. These tables are on display in our showroom and are available to buy. Please inquire if you're interested in having a table made from your choice of wood. Specially commissioned for the Borders Book Festival, I wanted the design to be striking and elegant and to show off some of the stunning wood our local area has to offer. Sycamore and Elm is a tried and tested combination and provides great contrast and definition. I used silky, straight grained Sycamore for the legs and base and some beautiful pippy Sycamore for the top. The audience won’t get to see the top, but I hope it gives some pleasure to the speakers! Hidden behind the panel is a small drinks shelf and book pocket. The clients for this commission came to me looking for a piece of furniture to tidy away all the bits and bobs which were cluttering the surfaces in their hallway. Being the first thing you see on entering the house it also needed to look fantastic and give a warm welcome. 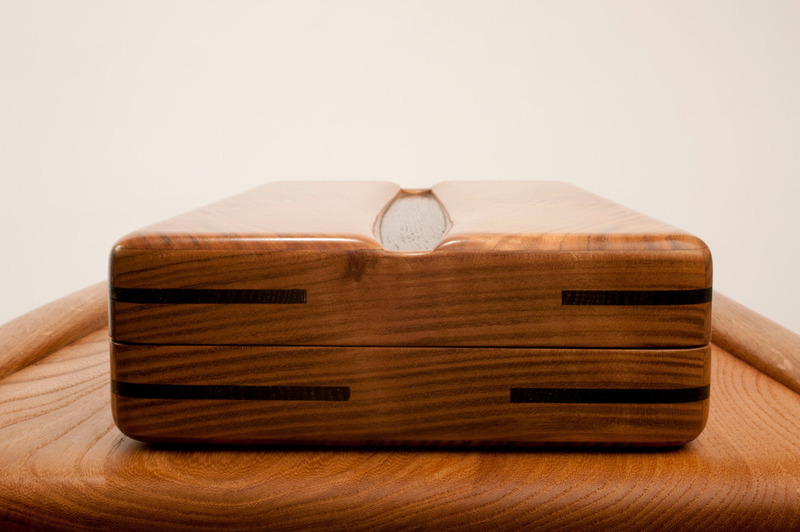 The shallow top drawer is perfect for keys, pens and papers etc. with plenty of space in the second drawer and cupboard for larger items. The handles are integrated into the design of the drawer and door fronts and made from some beautiful crown cut Ash to contrast with the darker coloured Elm. The tapered sides give the cabinet an elegant and sophisticated look with the tops sculpted to give a soft finish which feels lovely to stroke. This dining set was designed and made for a large open plan living space in a beautiful barn conversion in Aberdeenshire. At 1.8m diameter the table can comfortably seat 10 people. The table design came first, with the chairs designed to match. The split-leg concept gives great strength to the table and allows room for the spine when sitting in the chairs. The bottom rails go through the legs and are scribed into a curved housing joint and pegged with walnut dowels. Oak with Walnut detail and natural leather seat cushions. Guide Price for dining chairs: £650 each. There is currently one of these chairs on display at our showroom. These chairs can be made to order in your choice of wood and upholstery. Please contact me if you'd like to know more. This modern-rustic TV table was designed to complement the striking architecture and beautiful views in the living room of a newly built country home. The main feature of the table is the thick, natural edge top which continues seamlessly down one side of the table to form a leg. This organic edge contrasts with the clean lines on the rest of the table to create an eye-catching, contemporary piece of furniture. The shelf accommodates a DVD player and Soundbar and the rail underneath was designed to hide the wall sockets and all the wiring. This table was designed and made specially for an exhibition at the Royal Botanic Gardens, in Edinburgh and is made using Elm and burr Elm from trees grown on the Edinburgh Meadows. A development of my 'Woodland Coffee Table' design, these table's are all about the curves of solid wood strips which cut through the tops. It is a slight move away from the symmetry that my work tends to favour, but there is still a very balanced overall look. The rectangular version was made to measure for a client who also wanted the addition of a magazine shelf. 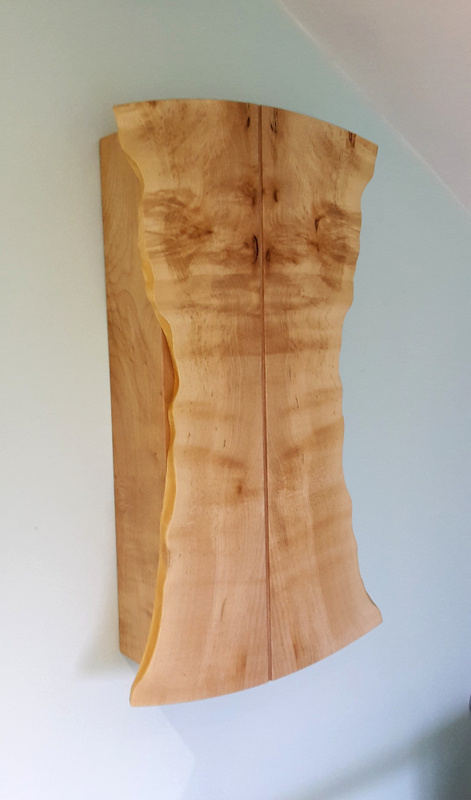 Commissioned as a special birthday present from father to daughter, the starting point for this design was a small board of Burr Elm I had left over from 'The Edinburgh Console Table'. We also had some Rippled Sycamore in stock and I knew they would make a striking contrast. My first draft had slightly more contemporary looking cantilevered legs but after discussions with the client I re-worked the design and came up with these more delicate, curved legs. These really show off the ripples in the sycamore which shimmer in the light as you move around it. Edinburgh Burr Elm and Rippled Sycamore. With a curved pedestal frame in Oak, the top of this table was made from a very special Beech Tree which grew nearby on the Lothian Estates. The outside showed nothing unusual so this interesting timber came as a most beautiful surprise. In the absence of an official name we call it 'Flecky Beech'. After being well seasoned and kiln dried I used it to make this table for our showroom and shortly after it was purchased as a display table for a family's Heirloom Tantalus. The central feature of this chair is the long curved back rest which is made from beautifully figured quarter sawn Oak. These tapered laminations have book-matched faces and provide a gentle spring when lent against, with a space down the middle allowing room for the spine. I used pegged bridle joints for the framework which are very strong and also visible, giving the chair a real feeling of strength whilst remaining light and elegant. The hand-carved solid elm seat joins all these elements together and adds a variation in grain and colour. This chair was awarded first prize at the New Forest Trust Fine Crafted Furniture Awards. Made for the same clients who commissioned the Trapezoid Coffee Table, this TV table has a similar leg design but with only three of them as the table sits in the corner of the living space. I chose to use some beautiful rippled sycamore for the legs as it contrasts nicely with the elm and looks stunning down the rounded edges of the legs. Elm with Ripple Sycamore Legs. 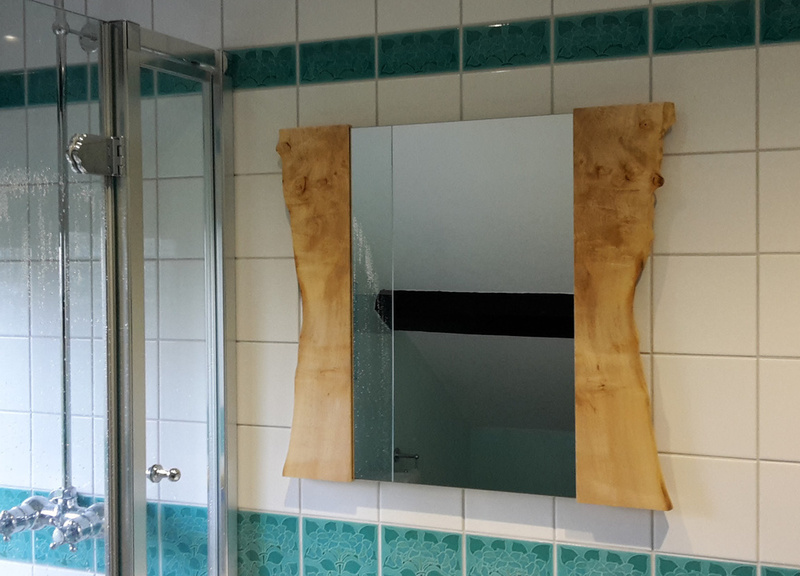 Set back at an angle, this free standing dressing mirror has a slight taper from top to bottom. This makes it very stable and gives it a distinct look. 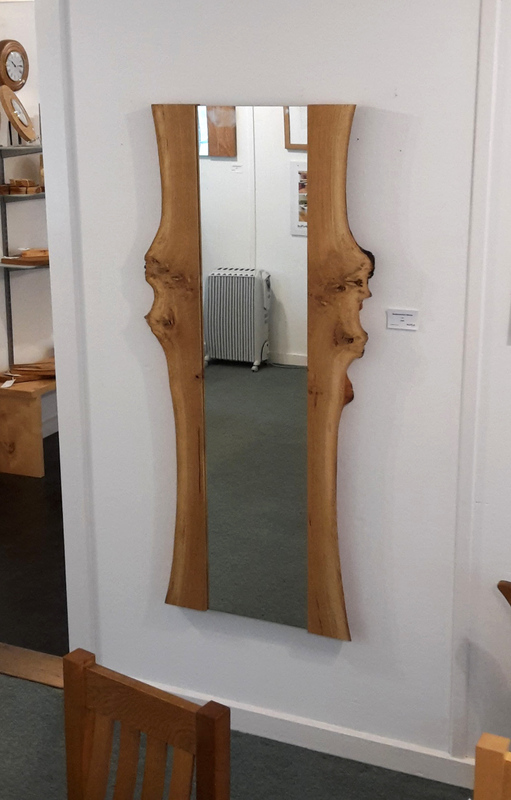 This mirror is currently on display at our showroom and available to purchase. It can also be made to order in your choice of wood. Please contact me if you'd like to know more. As the name suggests, the design of this tall cabinet was inspired by butterfly wings with their beautiful patterns and elegant symmetry. Behind the handless doors there are shelves and a small drawer giving this cabinet many possible uses but making it ideal as a drinks cabinet. The door inlays and drawer front are made from the Bubinga I had left over after making the 'Flying Shelves'. It was a special piece of wood, given to me by my furniture tutor, Craig Murchie and I was keen to make the most of it. This was a rather rare project in that I actually made time to design a piece for my own home! We wanted a large, low coffee table for the family living room and I liked the idea of trying to use several different species of timber to reflect what you might find in a British broadleaf woodland. I also took the opportunity to experiment with joining curved sections of wood together to create a pattern in the table surface. It wasn't without it's technical difficulties but I am very pleased with the result and it is always a talking point with guests. 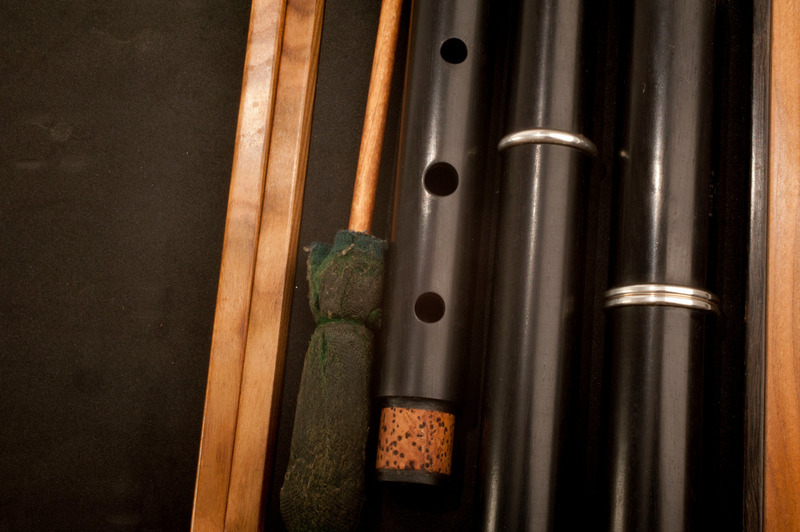 Oak, Ash, Elm and Sycamore. This was a commission for the Chaplaincy Centre at the Borders General Hospital near Melrose. It is a lovely semi-circular room with large glass windows looking onto an inner courtyard pond. It is a special space within the hospital which is used by lots of different groups as well as for religious and spiritual services. The larger table was to be used for meetings and also as an Altar table during services. The smaller table was also to be multi-functional but primarily designed as a Credence table to be used alongside the Altar table in services. I used some stunning rippled Ash for both tables and built the curved frames with very strong pegged tenons and cross-halving joints. When my old furniture tutor was kind enough to give me a beautiful board of Bubinga, I knew I had to make something special. He said he'd had it sitting in his workshop for over 40 years “just waiting for the right project”. Bubinga is a tropical hardwood which I wouldn't normally choose to use but it is a lovely wood to work with and polishes up to a wonderfully smooth sheen. I had been experimenting with various wing shapes in my work and this was an ideal opportunity for me to produce something more sculptural. The shelves are mounted on the wall with hidden brackets. The sitting room for this table has fantastic height and is dominated by tall, dramatic windows and a large fireplace with mirror. This height is well complimented by long, low sofas and required a similarly bold, well grounded coffee table. My starting point for the design was a truncated pyramid, turned on it's head. Rather than pointing up to the stars this shape tapers downwards, towards a central point below the ground. I looked at various ways of using this shape, to best suit the space and incorporate a storage shelf and came up with the idea of an open sided box floating between two leg frames. The solid ends help to emphasise the tapered shape, but by floating it just above the ground, the design becomes more subtle and finely balanced. It was a challenging piece to build but makes a striking, contemporary centrepiece for this lovely Georgian residence. If you'd like to know more about any of these pieces of furniture please contact me and I can send you further images and information. I always have a selection of clocks and mirrors in the gallery and they can also be made to order. Please contact me for prices and availability.